Space is full of mystery. The human mind is only capable of knowing so much and there is so much more than that in the universe. Astrona is from that part. Although she takes the form of a humanoid woman, Astrona seems to be some sort of living embodiment of the idea of helping others. She soars the cosmos detecting what she calls “scarred stars” which have been poisoned by negativity. Around these stars are often planets with societies that have problems (disasters, tyrannical rulers, plague, etc.) and Astrona comes down as a sort of messianic figure and helps them, which heals the star. 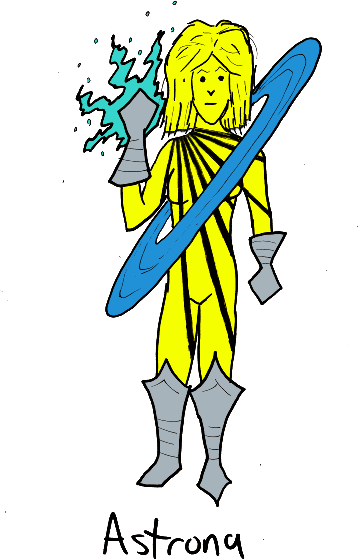 Astrona is just my attempt to make a trippy cosmic sci-fi character in the style of the seventies comics when cosmic was an in-style thing. The problem is, I haven’t read all that much of the trippy cosmic sci-fi from the seventies, so I’m kinda phoning it. In case it isn’t obvious that is supposed to be a sort of Saturn-style ring around her. I have no idea how that works either. Konwaag comes from a planet that we would describe as post-apocalyptic. The world, once a high-tech utopia, was brought to ruin by a cult of wizards who sought to take over. Although the wizards were overthrown, the cost was too great. Konwaag grew up in the aftermath of this war and saw the damage that magic did, so when he found a trove of war-time technology designed specifically for hunting down wizards, and a space ship to go with it, he set about the universe to hunt down those who would tamper with magical forces. 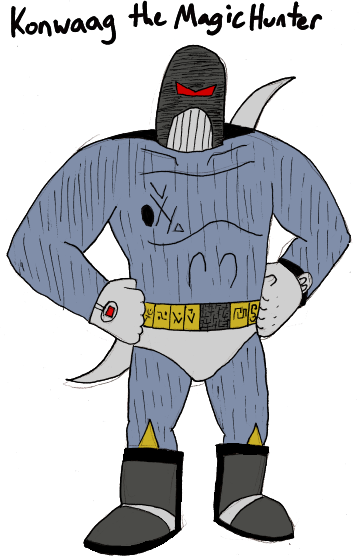 Anyway, I don’t think Konwaag could stand on his own as a hero, probably, but I like the idea of him being a rival to another superhero, sort of like how Vartox was a rival for Superman, except instead of fighting over women, the hero (let’s say Noblewoman) would have to prevent him from attacking magic-users who aren’t evil, but they’d still work together against legitimate threats.